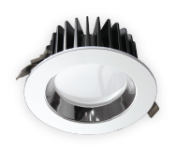 The ECOLight range of domestic lights incorporates household bulbs and downlights as well as floodlights for domestic or office use. This range is extremely high quality and environmentally friendly - Mercury free. ECOLight commercial lights cover a range of applications, from offices and transport hubs to retail spaces and more. They offer dimmable functionality, cool white light, easy installation, and significant energy savings over traditional fluorescent lights. Industrial applications are a specialty for the ECOLight range, with a light fitting to suit every application. There are many options which can be added to our lights depending on your application. Polycarbonate lenses for the food industry are also available. The ECOLight range of street light fittings is high quality and modern looking. They enhance the visual aspect of the location they are installed in. You won't be disappointed with these lights, there is a beam angle and lumen level for all applications. These are quite simply the best temporary light stands ever! The range includes 10W, 40W and 400W LED flood lights models with telescopic stands and hard-wearing carry bags or cases. AC, DC and AC/DC versions are available depending on the model chosen. With LED technology capable of saving so much money on your energy bill, why not go all the way and power them with solar energy? 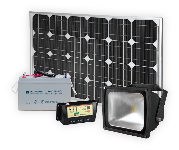 We have solar flood light and solar street light kits ready to go or our technical team can customise them to suit. Adjustable light and motion sensors add to the efficiency and convenience of the LED light bulbs. They will switch on the selected lights as soon as they detect movement and switch off when they haven't detected movement for the selected amount of time. SPARTAN is a full range of ATEX / IECEx LED floodlights for hazardous area environments. Available in Infra-Red and White-Light, SPARTAN delivers the highest performance, most energy efficient, modular and maintenance friendly solution for extreme environments.